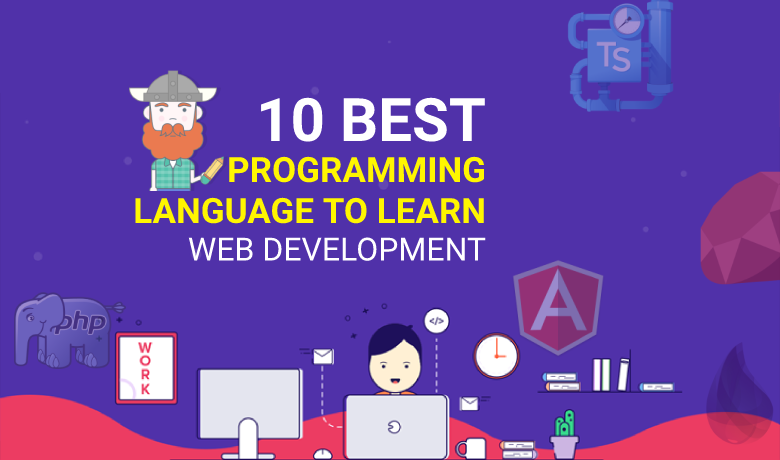 “Which is the best programming languages should I learn for web development ” is one of the most popular topics these days. It’s difficult. There are several programming languages to pick these days. Whenever you have a lot of options, it is more difficult to decide to learn programming languages. We love choices and options, but more alternatives make it harder to pick. That’s why I desire to cut it down for you and make it very simple. In this article, I wish to talk about a top-to-bottom way that anybody can decide on learn web development. I’ll share not just the most popular development programming languages but also the best resource to assist you to master the programming languages. Why should you Learn and use TypeScript Programming Language? What Should you learn in TypeScript Programming Language? HTML5 is the newest development of the standard that describes HTML. It is a new version of the programming HTML, with unique attributes, new elements, and new behaviors, and a higher set of technologies that lets the making of more different and powerful Web and app. HTML5 adds specific processing standards to encourage more interoperable implementations; it enhances and justify the markup available for docs, and presents markup and API for complicated web applications. Why should you Learn and use HTML5 Programming Language? What Should you learn in HTML5 Programming Language? CSS3 is the newest development of the Cascading Style Sheets language and focus on enlarging CSS2.1. It takes a lot of long-awaited innovations, like curved corners, shadows, gradients, transitions, as well as different layouts like multi-columns, dynamic box or grid layouts. What Should you learn in CSS3 Programming Language? PHP is a server-side scripting programming language intended for web development but also utilized as a general-purpose programming language. PHP language Code may be inserted into HTML language Code, or it can be utilized in mixture with different web template systems, CMS, and other website frameworks. The PHP code is often processed by a PHP interpreter integrated as a module in the web server or as a CGI executable. Why should you Learn and use PHP Programming Language? What Should you learn in PHP Programming Language? Ruby on Rails is a server-side web framework designed for Ruby. It’s is an MVC framework, implementing default structures for a DB, a web service, and website pages. Why should you Learn and use Ruby on Rails Programming Language? What Should you learn in Ruby on Rails Programming Language? Elixir is a dynamic, functional programming language intended for developing scalable and manageable applications. Functional programming supports a coding design that assists developers to write the program that is compact, fast, and maintainable. Why should you Learn and use Elixir Programming Language? Prerequisites to Learn Elixir Programming Language? What Should you learn in Elixir Programming Language? Rust is an open-source programming language that focuses on parallelism, speed, memory, and safety. Developers are utilizing Rust to build a broad range of modern software and web applications, such as game software, OS, file systems, web elements and simulation engines for virtual reality. There’s a developing group of companies using Rust in creation, such as Coursera, Chef, Postmates, npm, and Dropbox. Another exciting modern development has been the GNOME community discovering Rust for web app development. Naturally, we don’t demand people to omit what they are previously using or rewrite all the things in Rust. Rust is very interoperable so that you can add Rust code to your platform without a significant commitment early one other language. Why should you Learn and use Rust Programming Language? Prerequisites to Learn Rust Programming Language? What Should you learn in Rust Programming Language? Custom Types – struct and enum. Flow Control – if/else, for, and others. Go (often referred to as GoLang) is a programming language designed for Google employees. (chiefly longtime Unix guru and Google distinguished engineer Rob Pike) — but it’s not strictly addressing a “Google project.” Somewhat, GoLang is designed as a community-led open source project, created by an authority that has strong emotions about how Go should be applied and the way the language should use. Go is intended to be easy to learn, honest to work with, and easy to understand by other developers. Go lacks a broad feature set, particularly when related to languages like C++. Go is suggestive of C in its syntax, performing it most comfortable for longtime C developers to learn. Why should you Learn and use Go Language? Prerequisites to Learn Go Language? What Should you learn in Go Language? Swift is a powerful and simple programming language for iOS, macOS, tvOS, and watchOS. Writing Swift language is dynamic and enjoyable, the code is comprehensive yet compelling, and Swift adds new features developers admire. Swift code is secure by design, yet also provides software that runs lightning-fast. Swift is a beautiful way to design software, whether it’s for mobiles, desktops, servers that run the code. It’s a secure, fast, and flexible programming language that connects the best in new language thinking with knowledge from the broader Apple engineering experience and the various participation from its open-source community. The compiler is enhanced for production and the code is advancing for development, without compromising on either. Why should you Learn and use Swift Language? Prerequisites to Learn Swift Programming Language? What Should you learn in Swift Programming Language? Mentioned above is the language that can make up you as a full stack developer! But, if you only need to do basic web development, then you do not want to master all these skills. However, there is no one skill fits all because it all depends on what you want to do. Hope this guide helped you to learn programming languages required to focus on full stack web development.